These nail stickers are amazing! Not only do they work wonders but each strip comes dual-ended. So whether you are in the mood for a French or full manicure, you decide. 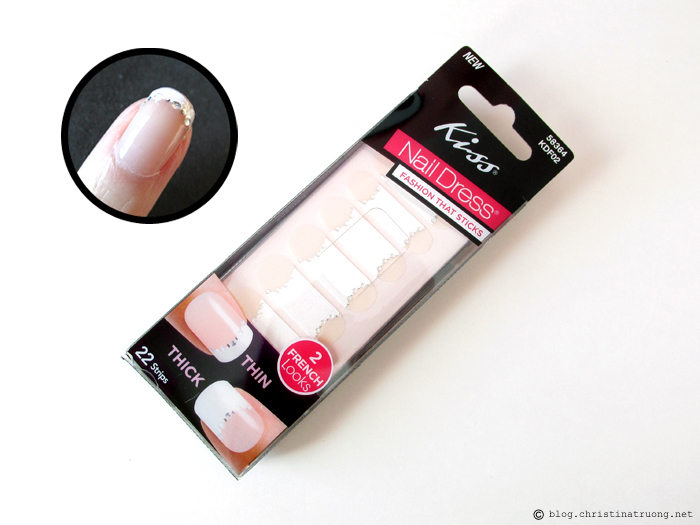 The KISS 2 Looks Nail Dress are super easy and quick to apply. They look and feel natural on the nails. And best of all, they stay on for DAYS! After 6 days of wear and countless hand washes, the strips stayed on. It looked just as good as when I applied it on day 1. I had to actually peel the strips off. It is recommended not to wear them beyond 7 days. To remove, gently peel off strip from the side. The strip sticks enough in that it won't slowly peel off but not so much that it would leave any residue on the nail. Which in my books is a win-win! Each kit includes the nail design stickers (22 dual-end strips in 11 sizes to fit all nails), instructional and nail design booklet and 1 mini nail file. Preparation: Make sure nails are free from nail polish. Optional, trim and file nails to desire length. Let me know in the comments: Have you tried KISS 2 Looks Nail Dress or any of there other nail strips? What are your thoughts?